Facebook is about to turn its “Friend List Feeds” option off, in a day or two. This will help you make your Facebook account much more personalized as you will not be bothered with the posts from ads on Facebook as well as other places or pages that you do not follow. It will only show the posts, particularly from your friend list. For this feature to work properly, you’d need a proper friend list first. This friend list can be edited later on as well if you find the need to. Making these lists seem to be a tedious job though, and according to the company’s representatives, 95% of the users don’t even have a friend list, to begin with. To make the matters easier, Facebook launched Smart Lists that auto-grouped the people according to the profiles, the people who shared the similar educational background etc. You would not have to build a list by yourself that way. 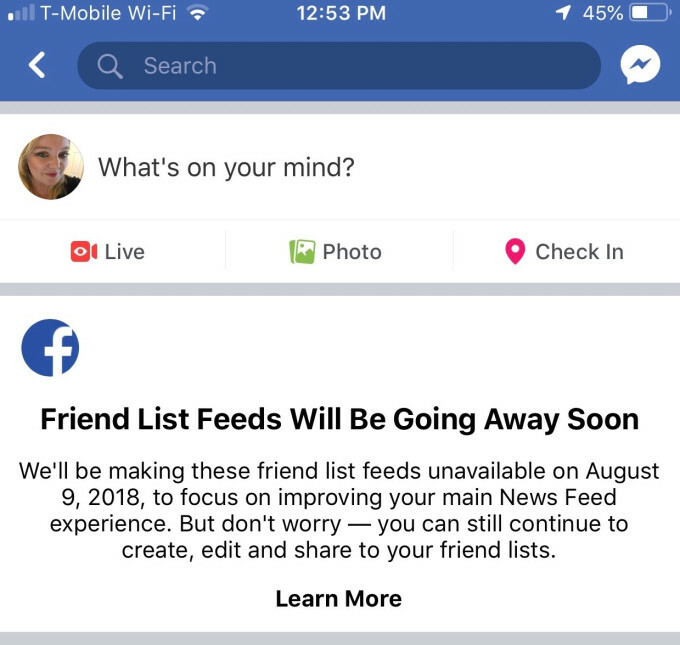 The message by the company says that it is shutting down the feature of Friend List Feed from 9th August 2018 onward. “We’re shutting down this lesser-used feature to focus our efforts on improving the main News Feed experience,” statement by a spokesperson. This update is still not strictly implemented throughout though, the company claims that this could be due to the older versions of the app that you might be using.